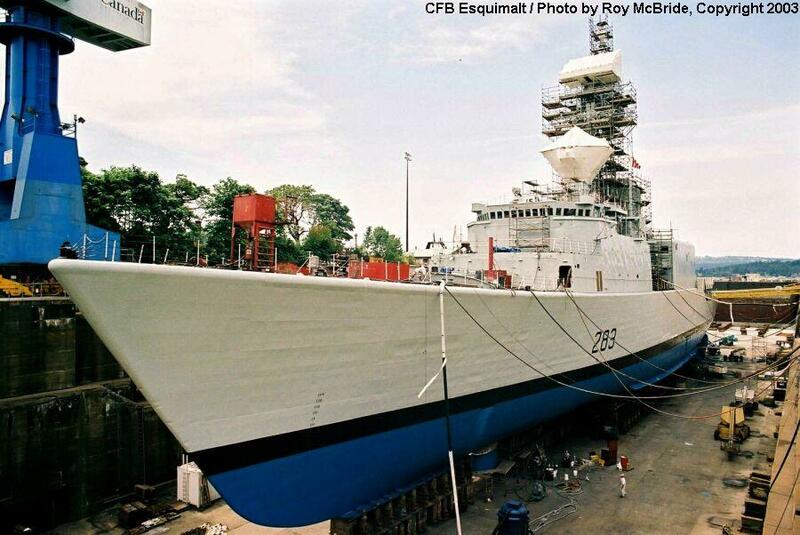 In the summer of 2003 our west-coast photographer, Roy McBride, was able to tour CFB Esquimalt. 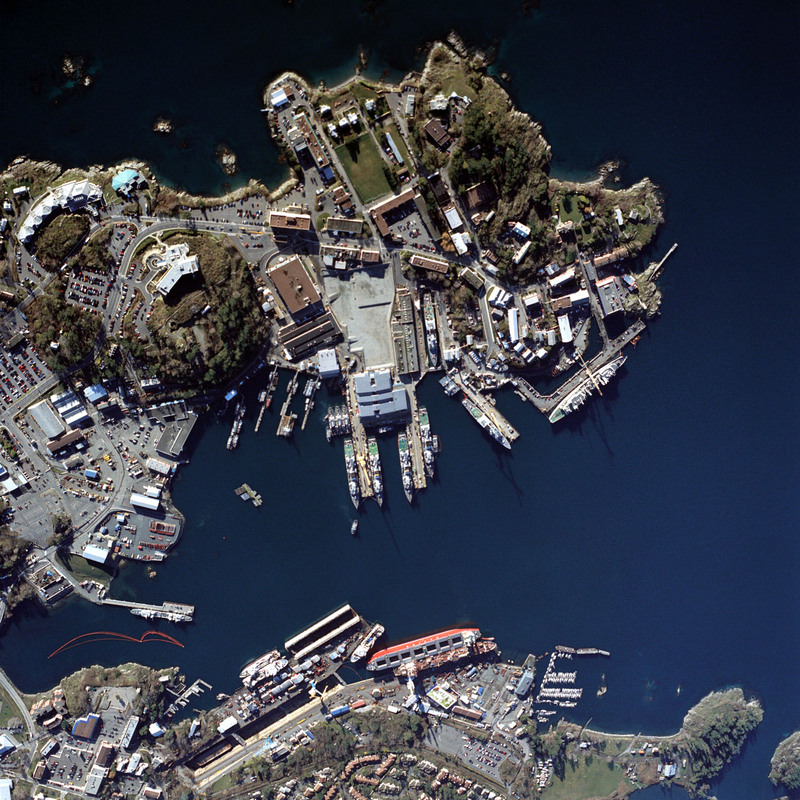 Esquimalt is the Canadian Navy's main west-coast base, home to two destroyers, five frigates, six patrol vessels, one replenishment ship, and a sail training vessel. The base provides complete operational support, maintenance, drydocking and overhaul facilities for all these ships, and soon will be home to a modern diesel-electric submarine. 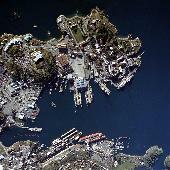 These photos provide an excellent look at Canada's primary Pacific base and the ships based there. 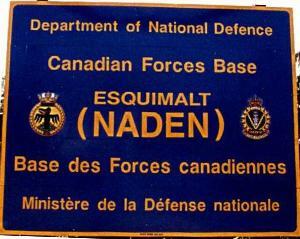 For more information about CFB Esquimalt, see the official website and history of the base. 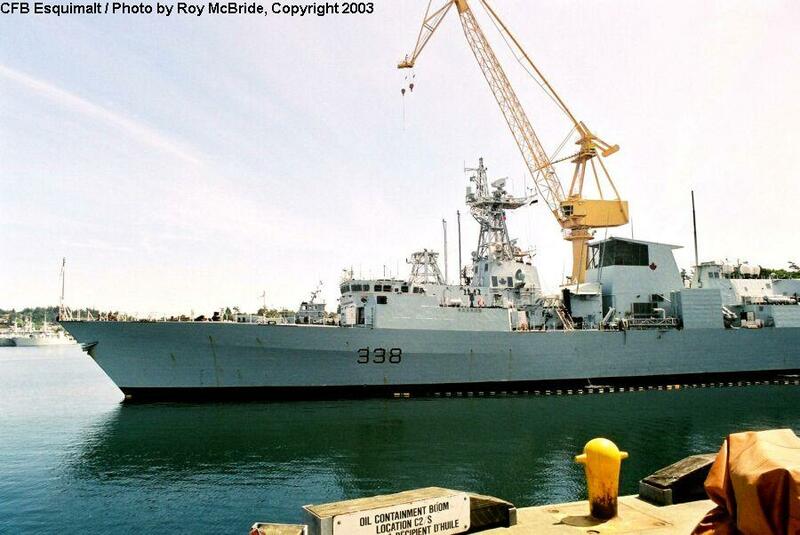 Special thanks to CFB Esquimalt and Roy McBride! 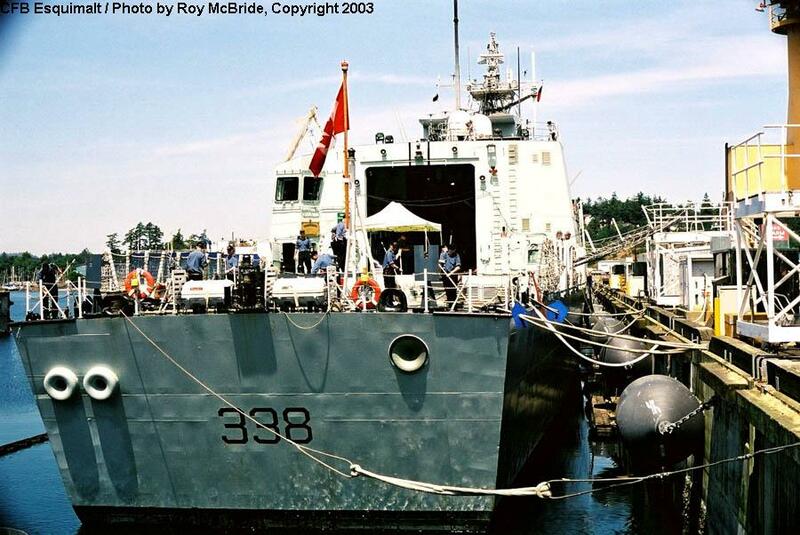 The destroyer HMCS Algonuin (DDH 283) is one of two air defense destroyers based at Esquimalt. 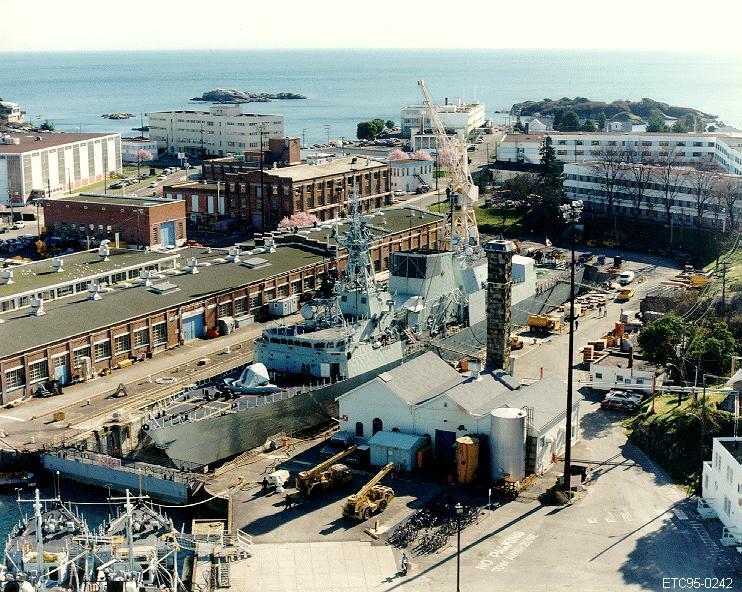 She was in the larger of the drydocks at Esquimalt, in the final stages of a major overhaul which will permit her to serve for several more years. 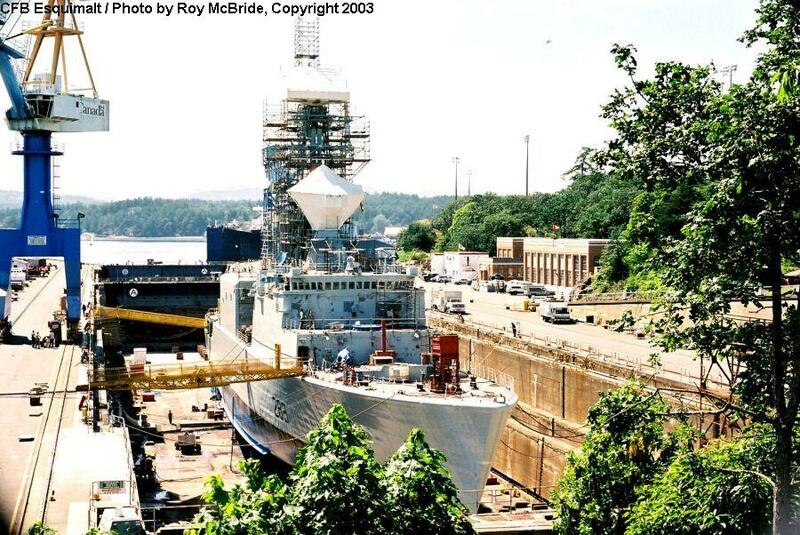 These views capture port and starboard aspects of the destroyer with most of the overhaul work done, but the mast still obscured by staging. 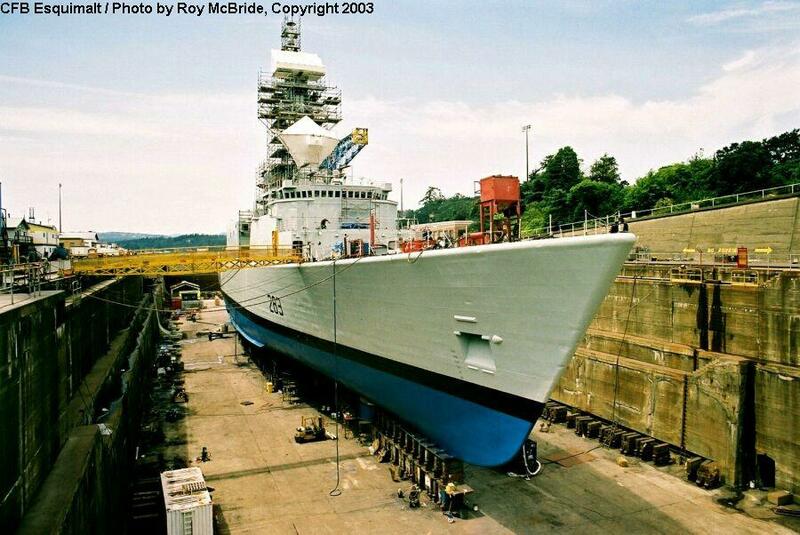 Notice that this drydock has two gates, so it can be split into two sections. Algonuin is in the inner end of the dock, leaving the outer section free to accommodate another ship. 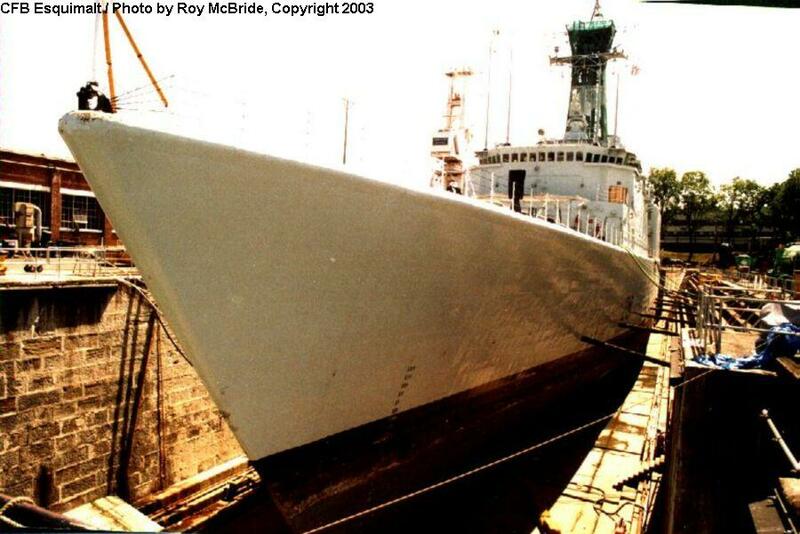 A dead-on bow view of Algonquin in drydock. 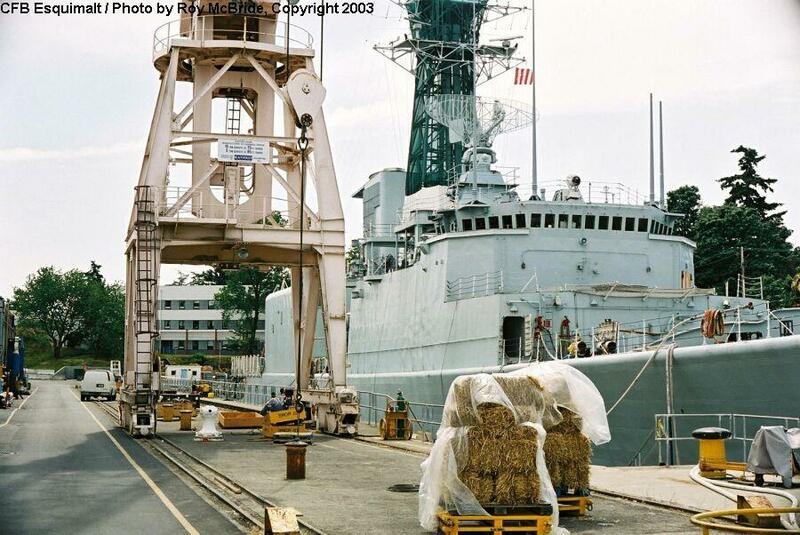 Note the hammerhead crane in the background, something rarely seen in a shipyard in current times. A port-side view of Algonquin's superstructure and mast. 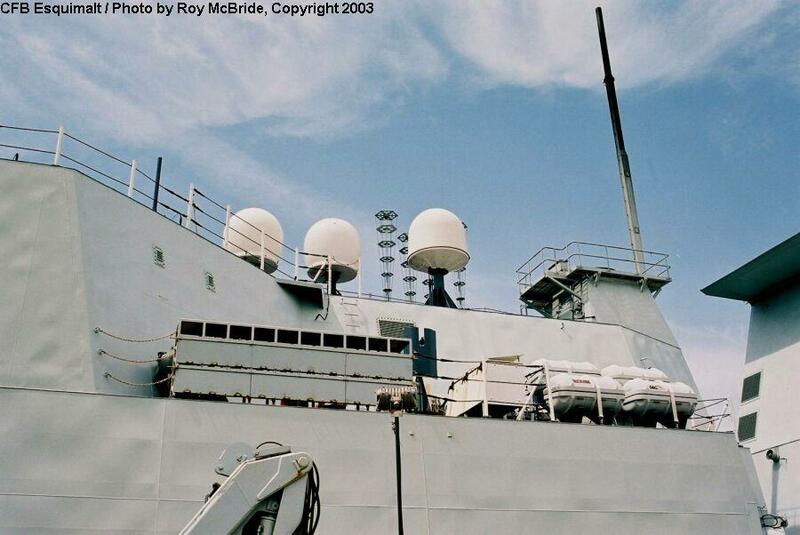 Her radars are enclosed in white plastic for the overhaul. Two port-side views of Algonquin from midships looking forward. 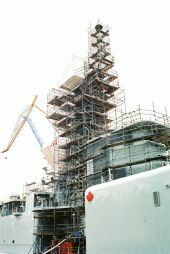 The first photo shows some of the staging around her superstructure, and the second shows a close-up of the hull-mounted sonar dome. 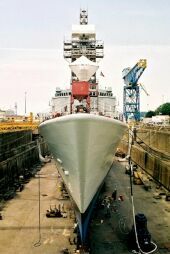 A hull-mounted dome is smaller and cheaper alternative to a large bow-mounted dome, but is not as effective for ASW operations. 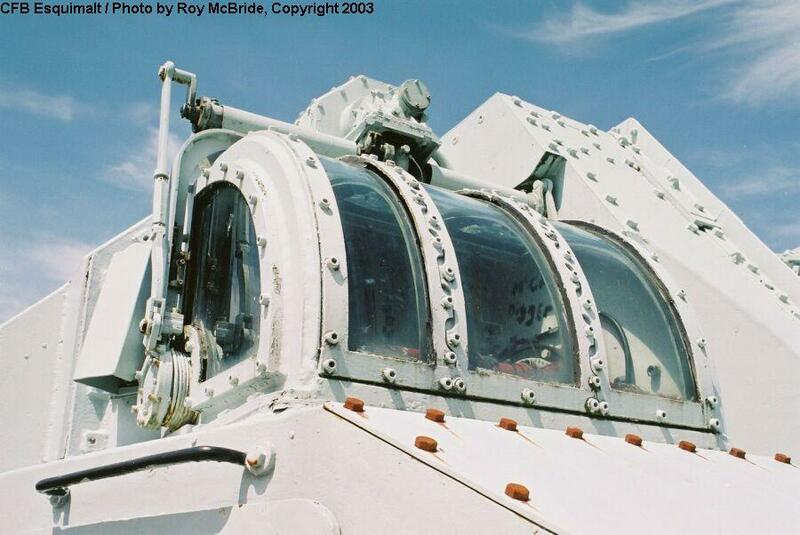 Note the very high keel blocking that is necessary to provide clearance for the dome while the ship is docked. 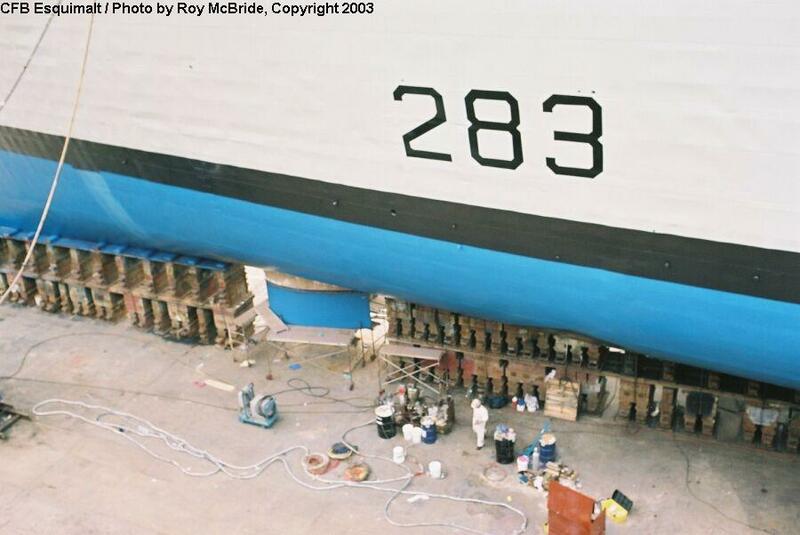 Two close views of the destroyer's stern, with propellers, shafting and rudders in the final stages of painting. 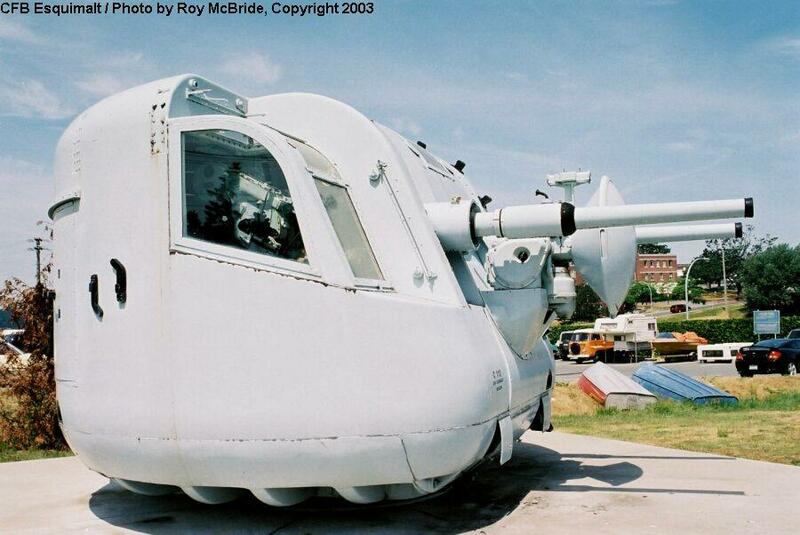 The large opening in the stern is to accommodate a towed variable depth sonar system. 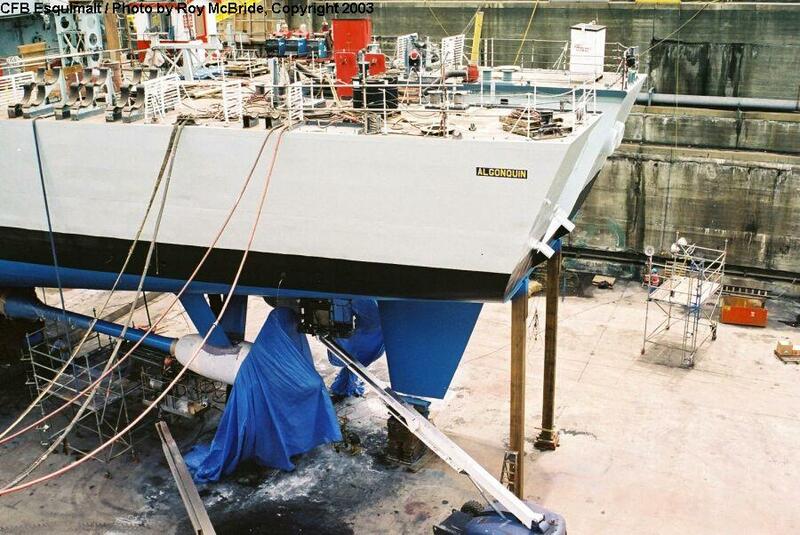 Two temporary support beams have been placed under the stern to avoid sagging of the hull, since the keel blocks stop well forward of the stern. A general view along Algonquin's port side. 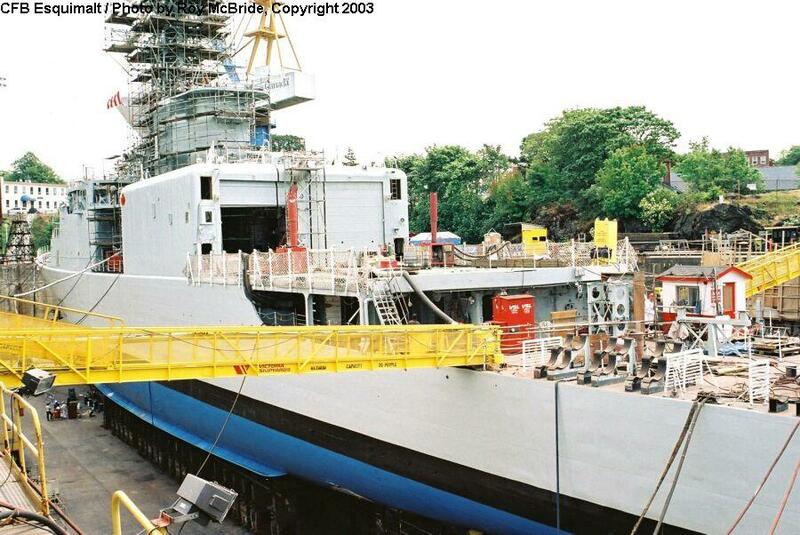 This photo shows some of the shipyard clutter that usually fills every available space on a ship undergoing overhaul. 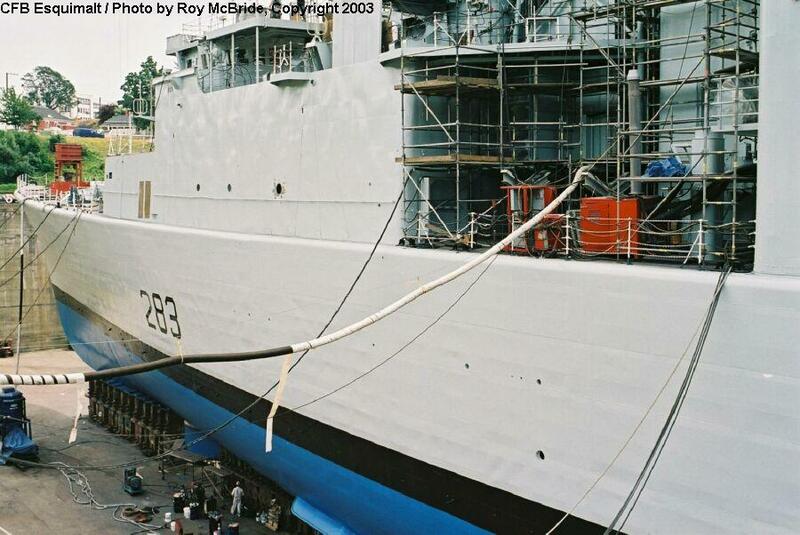 Esquimalt's other destroyer, HMCS Huron (DDH 281) has been out of service for a period, and was in the early stages of a major overhaul. 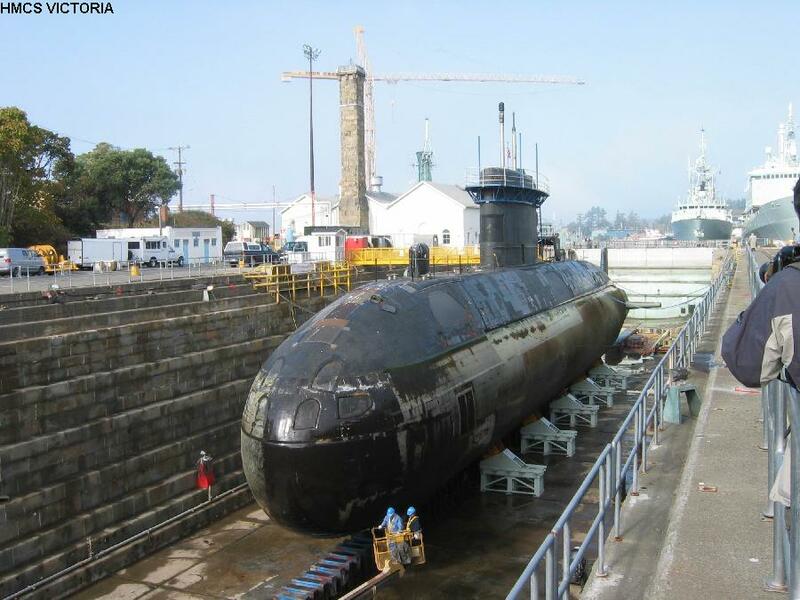 She is seen here in Esquimalt's smaller drydock. A pair of view close alongside Huron. 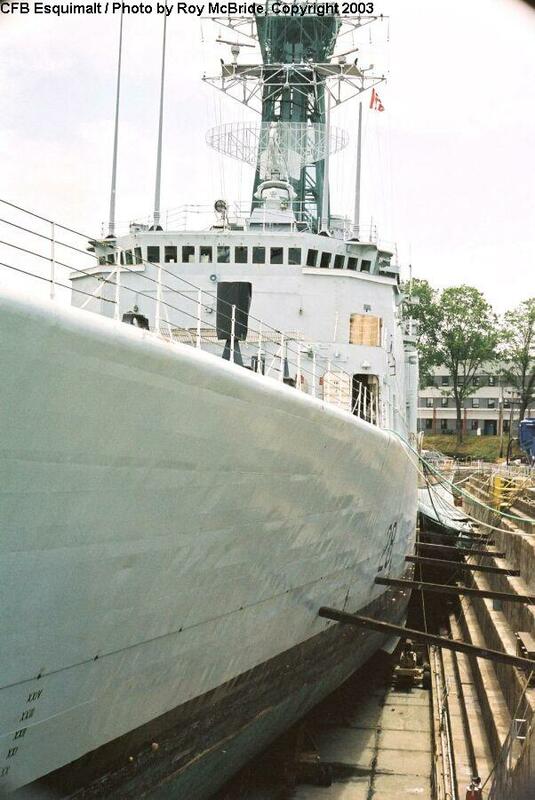 In this older, smaller drydock, there is little clearance between the ship and the dock walls. Notice the use of timber shoring to support the ship - horizontal shoring of this sort is relatively uncommon now, as most ships can stand upright on blocking without additional support. 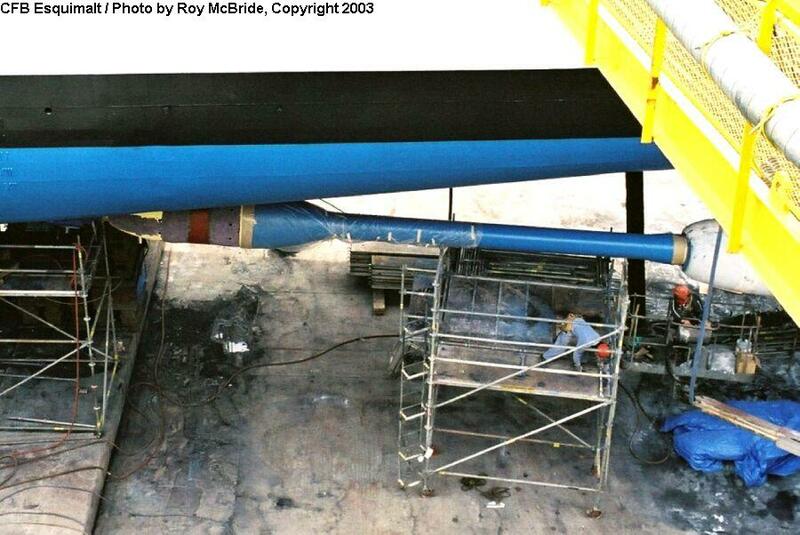 Also note the sonar dome pit in the drydock floor (photo at right), presumably a later addition to the old dock. 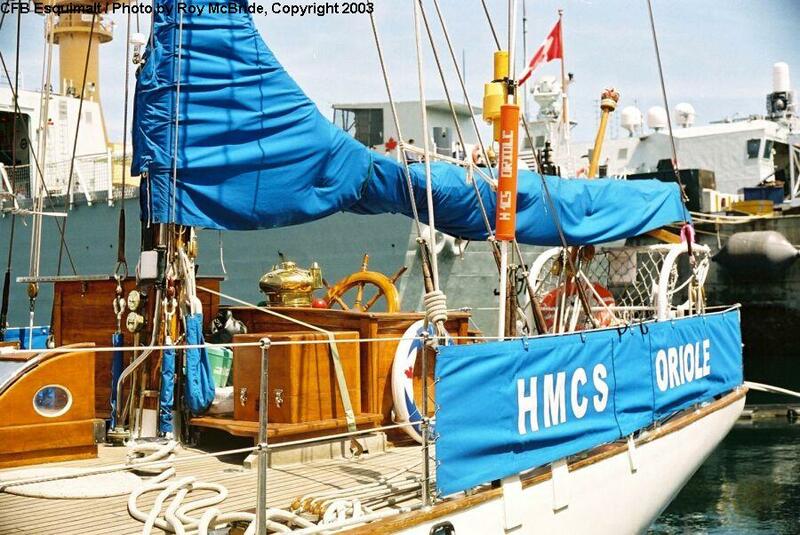 Huron's mast, completely enclosed in staging. A deck-level view of Huron deckhouse, looking aft along the starboard side. 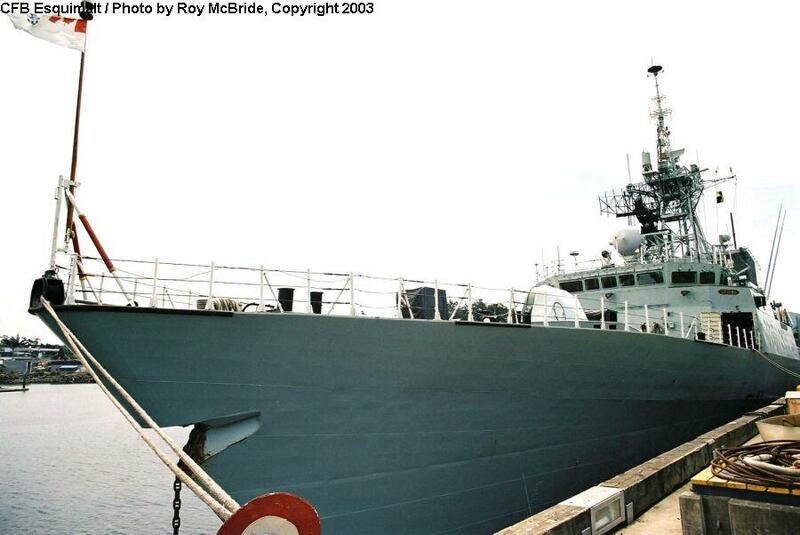 Two port-side views of Halifax class frigates. 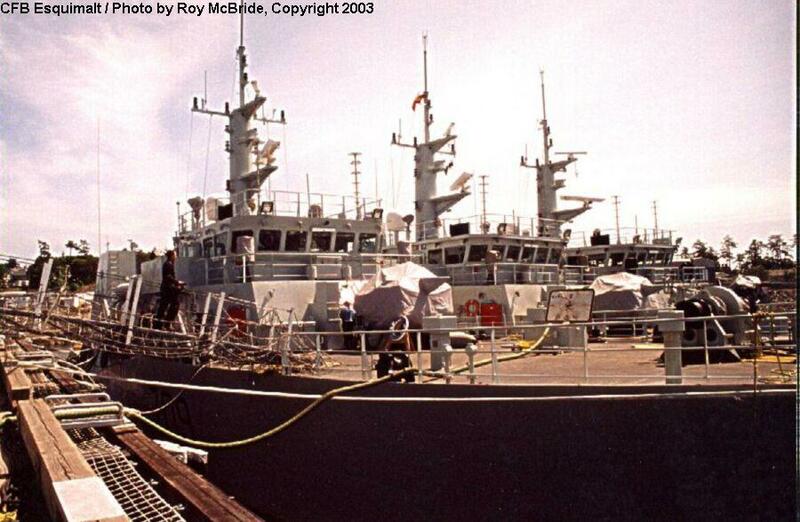 At left is Winnipeg (FFH 338), commissioned in 1995. Port (left photo) and starboard (right photo) view of frigates' aft superstructures and helicopter hangars. 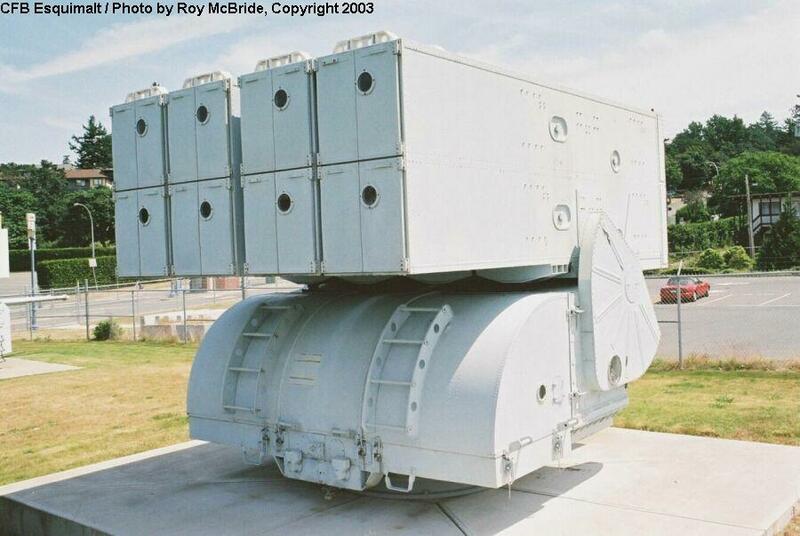 There is a fire control radar at the forward end of the hangar structure (missing in the right photo), with numerous antennas on the superstructure, and a Phalanx CIWS further aft. 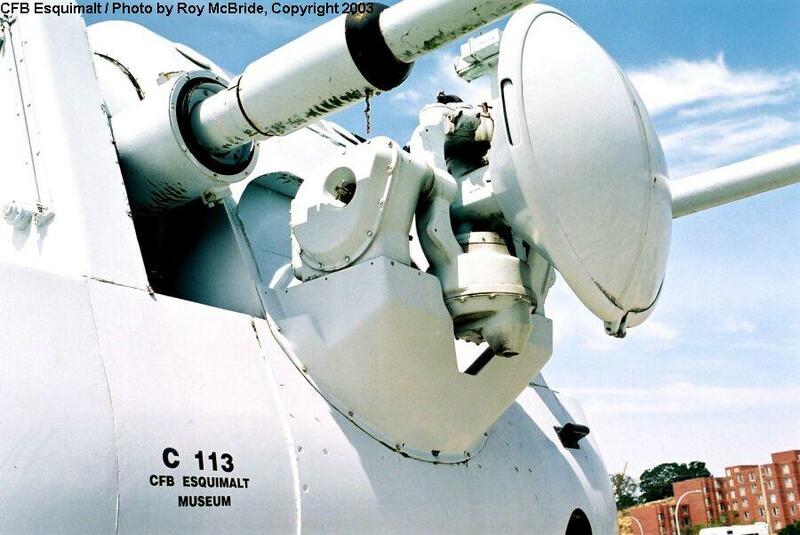 A close view of the CIWS atop HMCS Calgary's helo hangar. A stern-on view of Winnipeg. 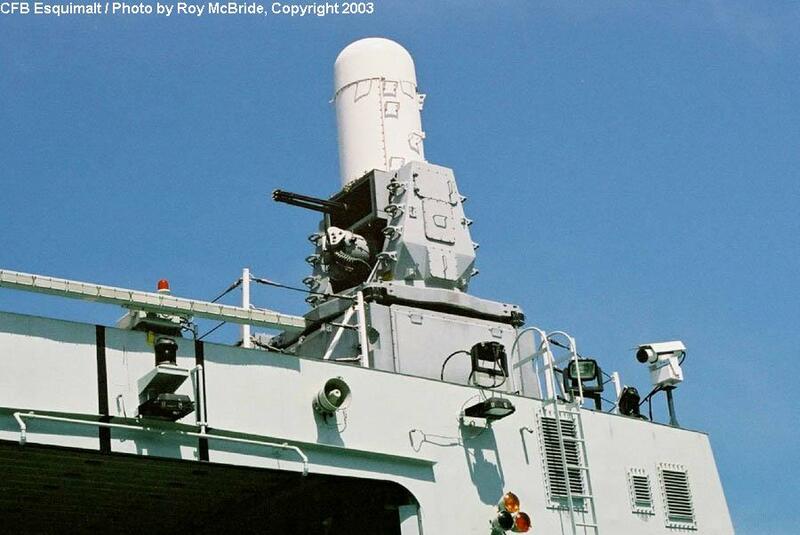 The two openings on her port side are for the SLQ-25 Nixie torpedo countermeasure; the opening to starboard is for the SQR-19 towed array sonar. 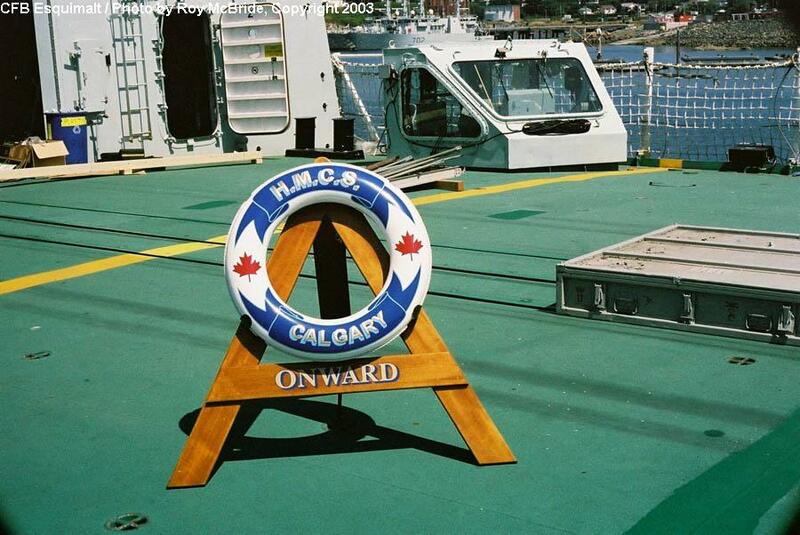 Aboard Calgary, on the flight deck. The helicopter hauldown track runs across the deck, with the control station in the background. 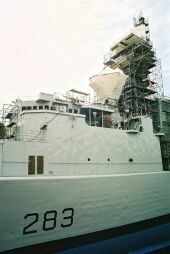 Port (left photo) and starboard (right photo) view of frigates' masts. 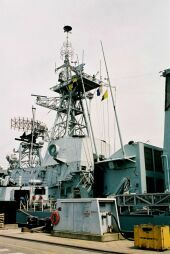 The primary air search radar is forward, above the bridge; the mast supports smaller radars and various other antennas. 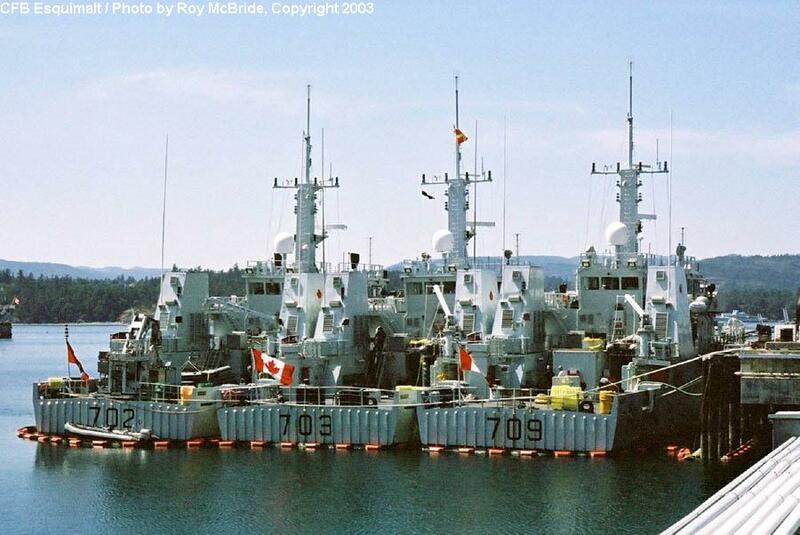 A group view of three of Esquimalt's frigates. 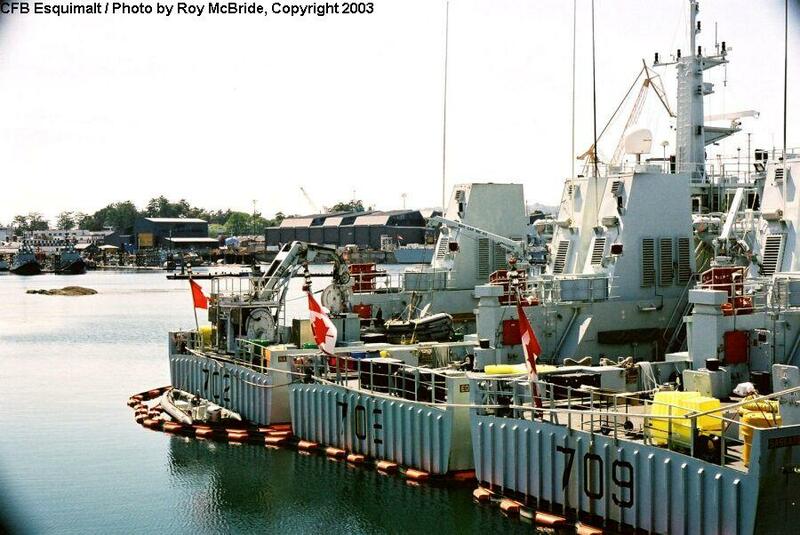 HMCS Calgary (FFH 335) is nearest, and the oiler Protecteur is in the background. 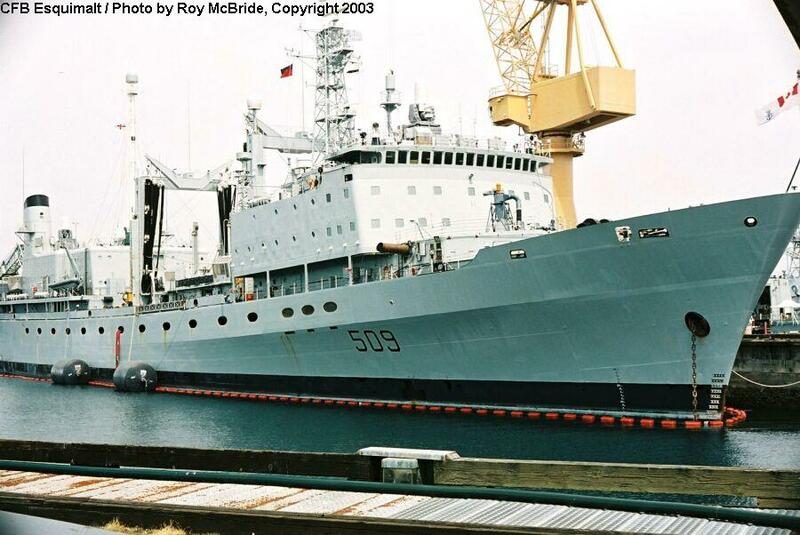 HMCS Protecteur (AOR 509) is the sole oiler/replenishment ship in Canada's Pacific fleet. As such, she often accompanies the frigates and destroyers when they are on lengthy deployments. Although smaller than the corresponding US Navy vessels, she operates on the same one-stop-shopping principle, carrying everything from fuel to food to munitions and spare parts. 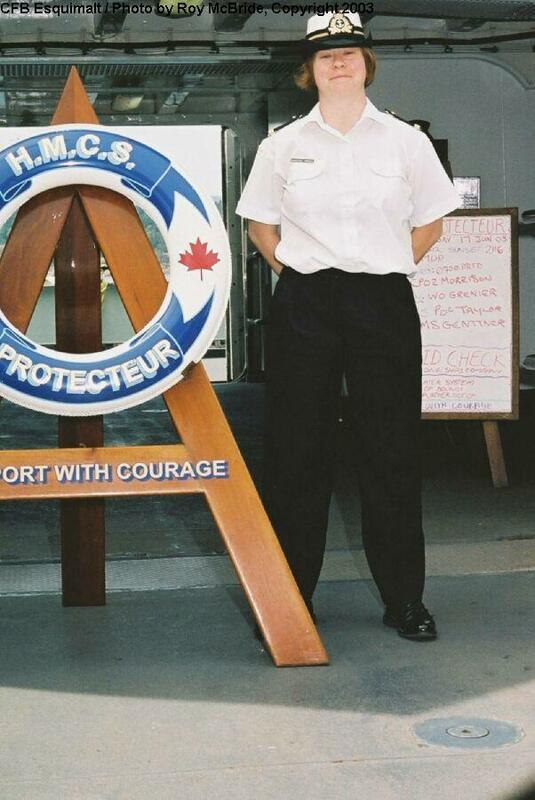 Acting Sub-Lieutenant Sonia Connock is a base public affairs officer, and escorted Roy McBride throughout the base. 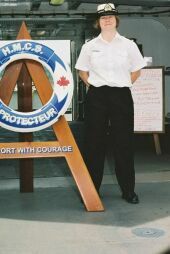 She is seen here aboard Protecteur. 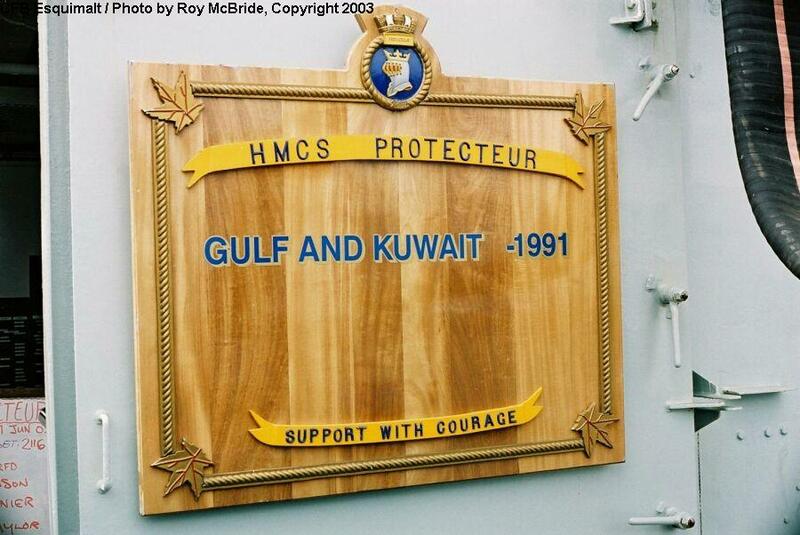 Protecteur's battle honors from the 1991 Gulf War. 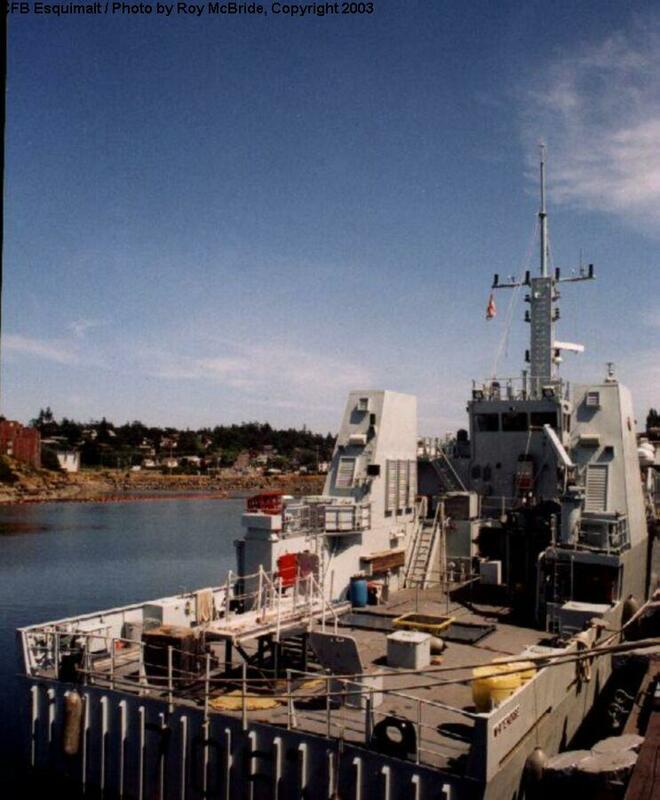 Esquimalt is also base to six MCDVs, multi-role patrol, training, and mine countermeasures vessels. 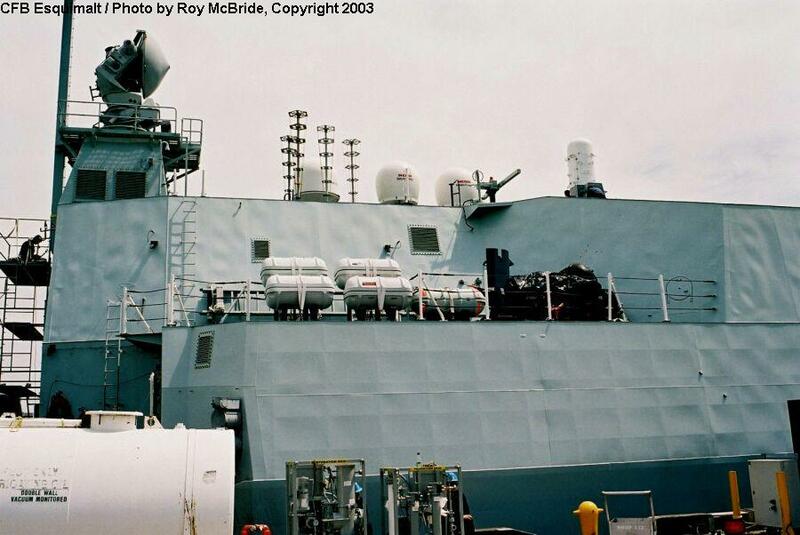 These are 15-knot, utility-type vessels, lightly armed with a single old 40mm gun forward. 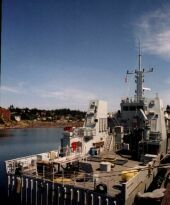 The MCDVs have a large open deck at the stern, suitable for carrying minesweeping, minehunting, salvage, or diving gear. However, as can be seen here, their decks are mostly empty. 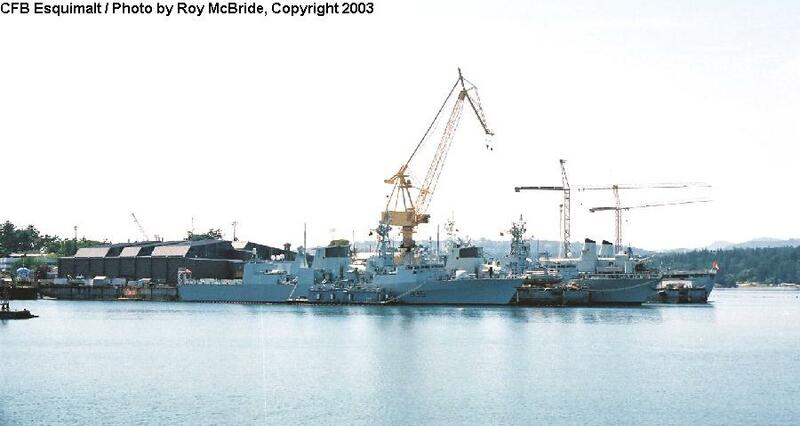 One of these four vessels has an additional crane fitted at the stern. 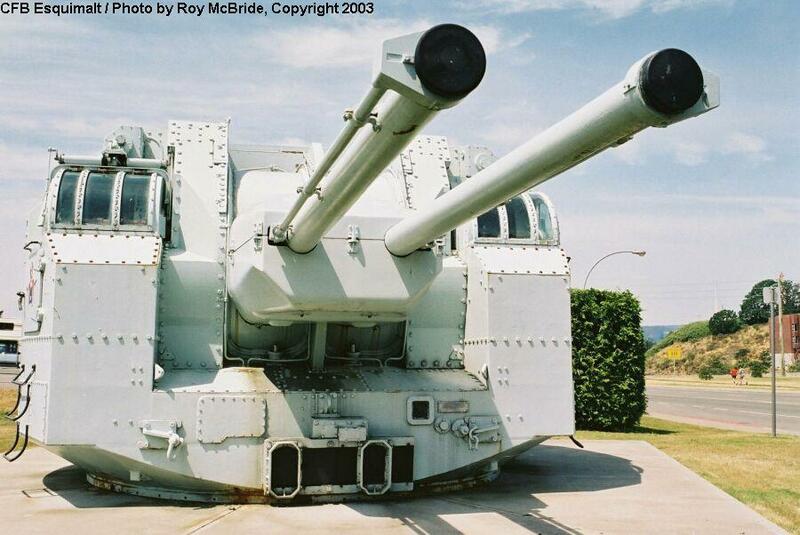 Another stern-on view of the MCDVs. 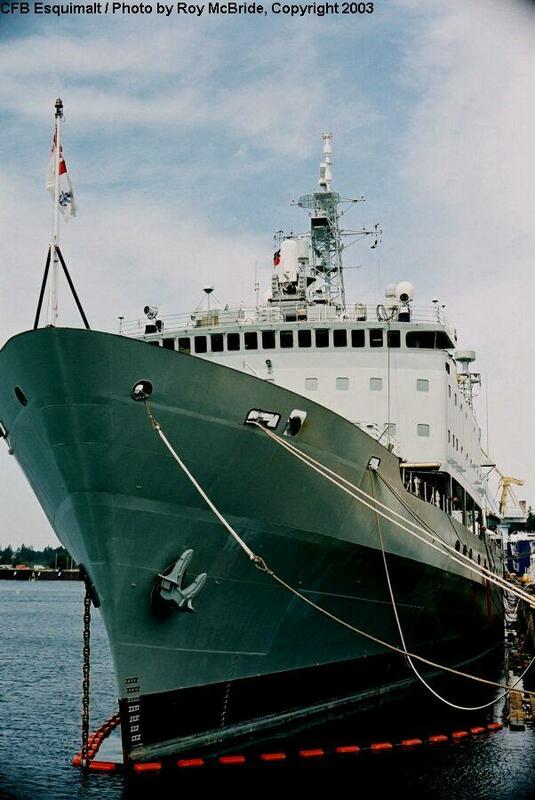 HMCS Oriole, Canada's primary sail-training vessel, also calls Esquimalt home. 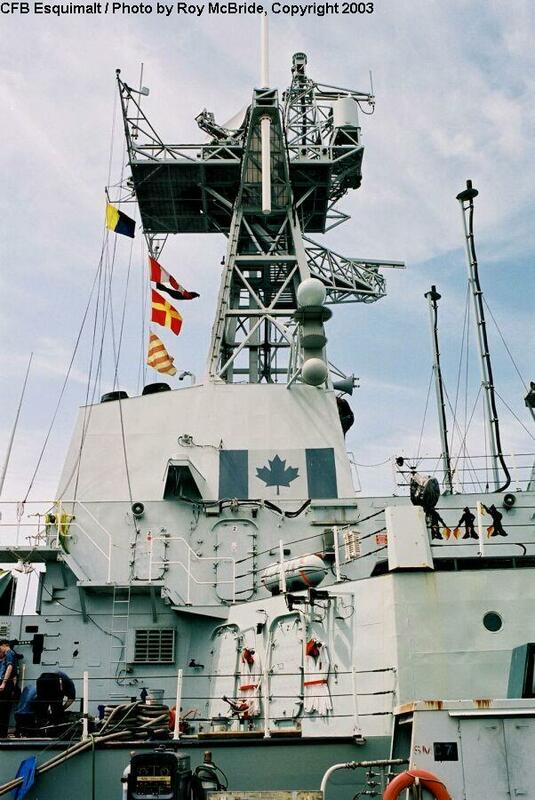 Oriole is the smallest and oldest commissioned ship in the Canadian navy. 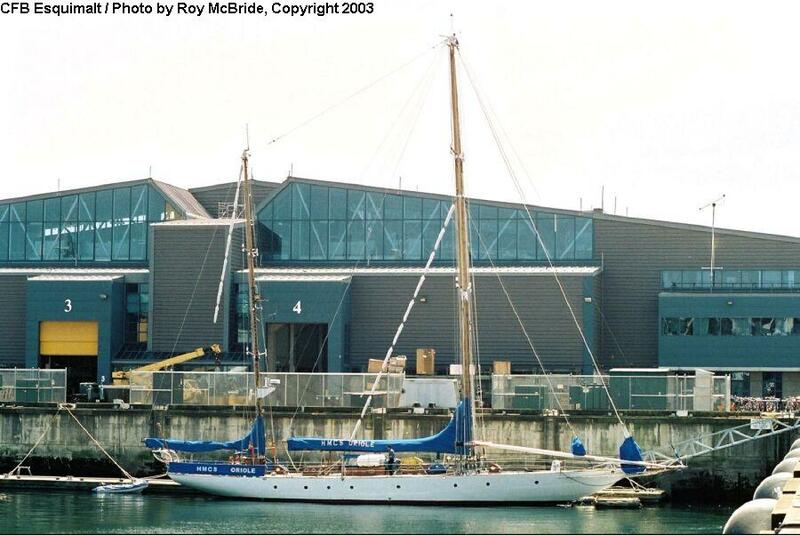 She was constructed in 1921 by Lawley Yachts, Quincy, Massachusetts, as a private yacht. 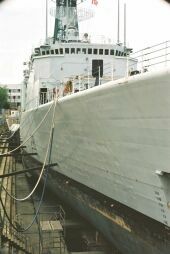 She joined the navy in 1952. 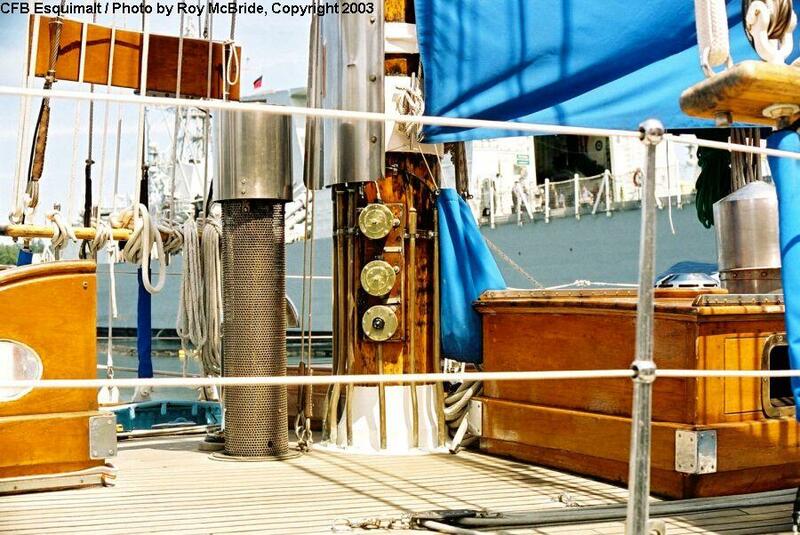 These views show the fine yacht finish maintained aboard Oriole. 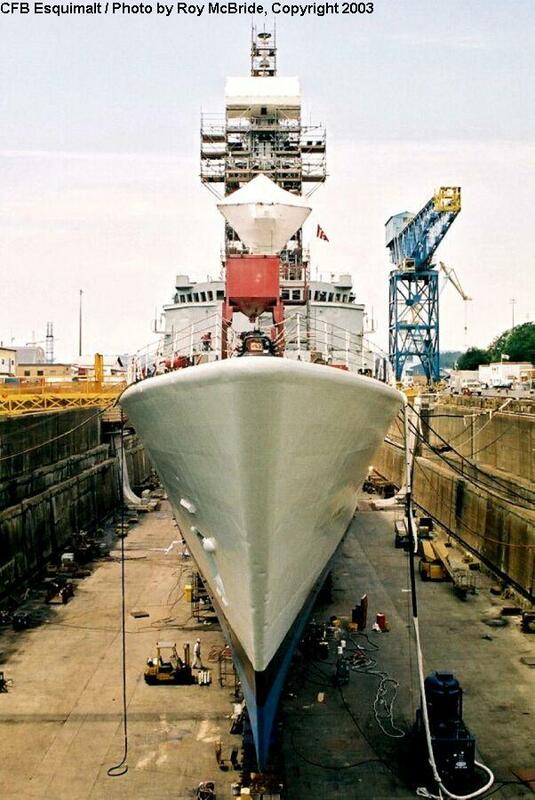 Her brightwork and polished metal are in sharp contrast to the gray warships in the background. 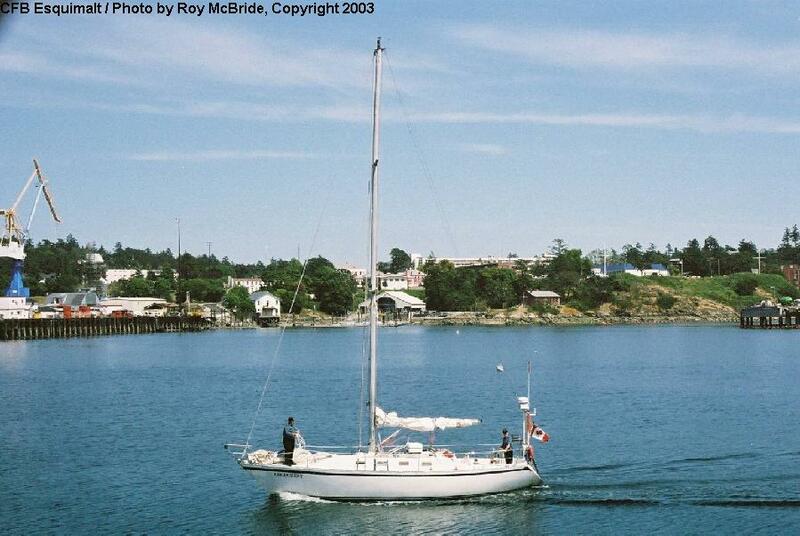 Esquimalt's sailing fleet also includes the sloop Goldcrest. 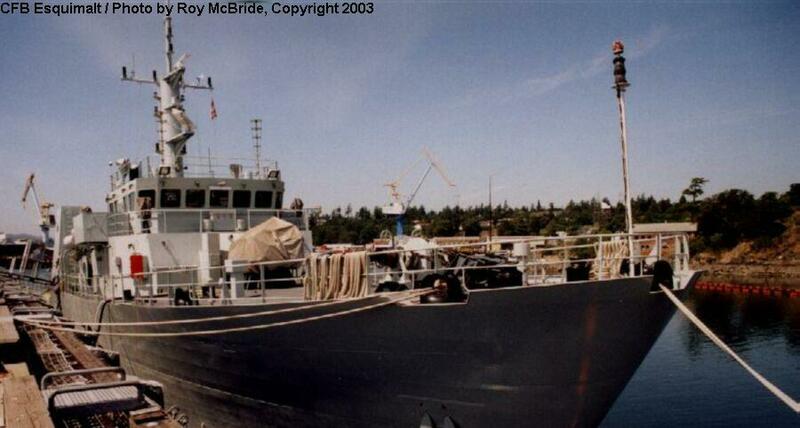 She is Navy-owned, but is not a commissioned vessel. 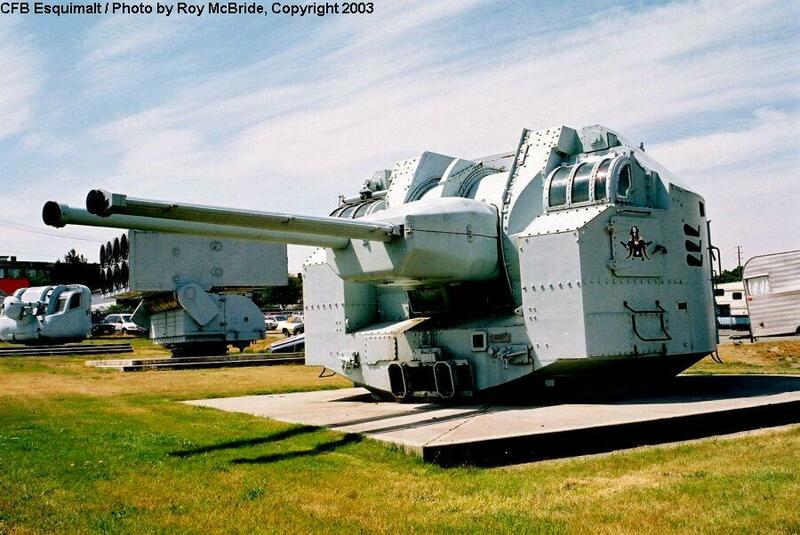 Three views of the Vickers 3"/70cal Mk6 twin gun mount on display in Esquimalt's museum. This dual-purpose mount was fitted in the Restigouche and Mackenzie class escorts of the 1950's. 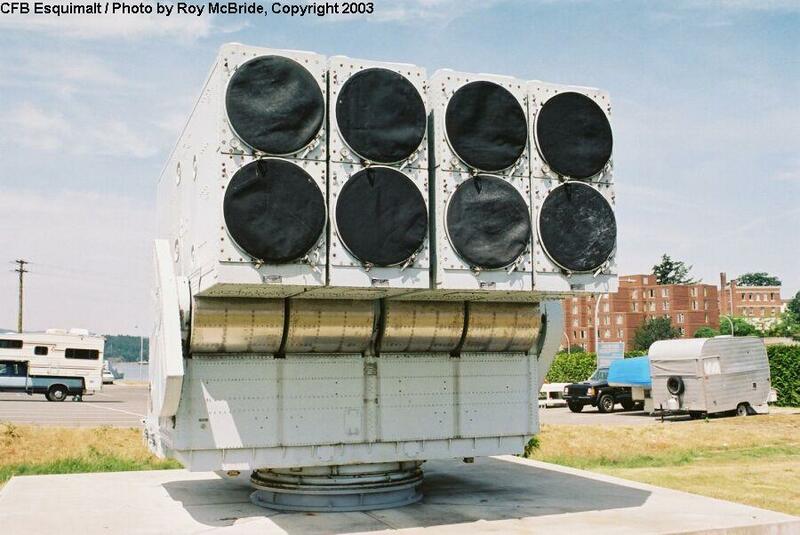 The Mk112 launcher is the Canadian version of the standard US Navy 8-cell ASROC launcher. It was installed in several Canadian ships during refits in the late 1960's and early 1970's. 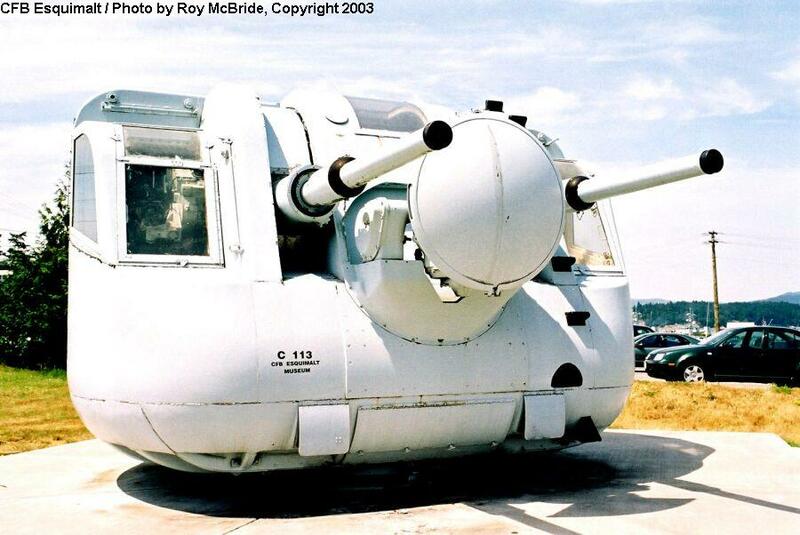 This is the Mk33 3"/50cal dual mount, a dual-purpose gun fitted in the two Annapolis class escorts. Photos Copyright © 2003, Roy McBride. All Rights Reserved.